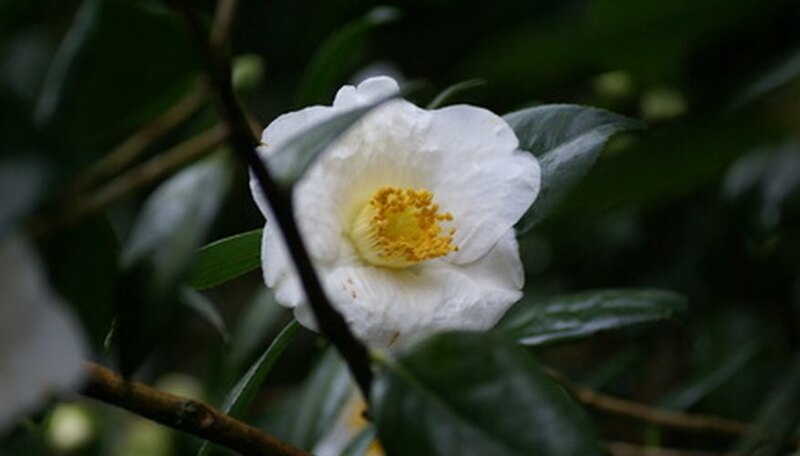 A well-adapted plant for southern gardens, camellia plants (Camellia) produce showy, large blossoms above evergreen foliage. This attractive shrub thrives in semi-tropical gardens and as a houseplant in colder climates. With over 200 species, camellias blossom in shades of pink, white, orange and red. Producing blooms between September and March, camellia plants add color and beauty to interior designs and southern winter landscapes. Although these blossoming shrubs present few problems for gardeners, certain conditions and disorders can damage these plants and deter from their beauty. Caused by a type of fungus, root rot can threaten the health of your camellia plants. Dark, discolored roots with soft patches found slightly below the surface of the soil indicates root rot. Easily avoided by using clean soils when planting camellias, root rot requires the use of fungicide preparations that treat fungal conditions in root systems. Like various other plants that grow in warm, humid conditions, camellia plants often display the signs of lichen growth. These growths appear as green mossy bumps along the stems of older camellias and plants that experience neglect. Plants that contain lichens often require fertilizer, water and mulch to enhance their growing conditions. An application of copper fungicide can kill this type of growth on your camellia plants. Camellia flower blight causes blossoms to lose their rich colors and turn brown. Caused by a type of fungus, this condition first appears as small brown spots on the petals of camellia flowers. A serious and rapidly spreading disease, flower blight requires prompt treatment to ensure the health of the plant. Remove infected blossoms and rake up nearby plant debris and old mulch. Since this fungus lives in the soil, an application of fungicide to the ground around your plants will help resolve this condition and prevent it from recurring. Although camellias survive in a variety of soils, they prefer rich, well-drained compositions with a slightly acidic pH level. Alkaline soil can cause a problem for these evergreen shrubs. They perform poorly in soils with pH levels above 7.0. A soil pH between 5.0 and 6.5 provides the ideal level of acidity for these plants. Adding organic matter, such as pine needles or pine bark, can increase the soil acidity and add some aeration to heavy soils.